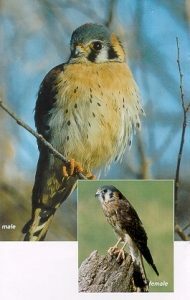 Comments: American kestrels are the smallest falcons in the United States and are common in Kansas. Because of their small size they used to be called “sparrow hawks.” Unlike other falcons, the plumage of young kestrels is very similar to the adults. Their blue-gray wings and crown easily identify the males. Females have rusty-brown wings. Kestrels are cavity nesters. They will use old woodpecker cavities and holes in trees, rocky cliffs and buildings. They will also use nest boxes when available in proper habitat. Distribution: They are found as far north as central Alaska and the southern part of Canada. Their range extends south through the United States, Mexico, Central and South America. Food: American kestrels prefer hunting areas with sparse vegetation and occasional perches. They are commonly seen hunting along the edges of highways where they often hover while searching for prey. They catch and eat large insects, small rodents, birds and reptiles.